On May 24, 1750, Conrad Weiser found himself facing the loaded gun of Andrew Lycon, a Scots-Irish squatter on Indian-owned land in the Juniata Valley. Weiser, who had agreed to accompany colonial secretary Richard Peters and some local magistrates into this frontier region as their Indian interpreter, must have wondered what he had gotten himself into. Like the colonial officials he was working for, Weiser considered squatters such as Lycon backcountry riff-raff, troublemakers who stirred up hostilities with Indians and refused to cooperate with colonial authorities. If peace was going to be preserved on the Pennsylvania frontier, Lycon and his neighbors had to go. Lycon saw things differently. From his perspective, Weiser and his party were tools of the Penn family, wealthy proprietors who lived in England and took no interest in the hard work or livelihoods of frontier families who made Pennsylvania a prosperous colony. When told by these officials that he had better remove himself peaceably from this land, Lycon said, "He would shoot the first Man that dared to come nigher [nearer]." Someone in Weiser's party (the record does not say who) had the nerve to call Lycon's bluff, for "he was disarmed, convicted, and committed to the Custody of the Sheriff." His home was burned to the ground at the insistence of Indians who witnessed the encounter. The influx of Scots-Irish settlers into the Pennsylvania backcountry in the mid-eighteenth century caused considerable tension with local Indians. In 1749 Iroquois chiefs meeting with Pennsylvania officials complained that trespassers were settling on land reserved for the Delaware and Shawnee Indians along the Juniata River and its tributary creeks. John Buxton, Once Upon a Time. Members of the Penn family, who hoped to profit from the eventual sale of these lands, were no more anxious to see squatters in this region than the Indians were. Therefore, in May 1750 the governor dispatched Indian agents Richard Peters and Conrad Weiser to evict the settlers there. Peters and Weiser recruited the help of fur trader George Croghan and several local magistrates before crossing the Susquehanna River at Harris' Ferry (modern Harrisburg). After joining with some local Iroquois, they crossed the Tuscarora Mountains and spent several days confronting the trespassers in their small communities, forcibly evicting some and burning their homes. 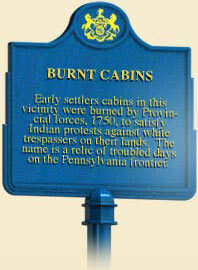 One such confrontation gave the town of Burnt Cabins its name. Some of the settlers confronted by Peters and Weiser objected to their treatment because the Penn family had encouraged them to settle there years earlier to assert Pennsylvanian possession of territory claimed by Maryland. Peters allowed them to stay until he received further instruction from the governor. Otherwise, the burning of the trespassers" cabins did little to forestall the tide of Scots-Irish emigrants crossing the Susquehanna. Just five months after their expedition across the Tuscarora Mountains, Peters wrote to Weiser that, "The People over the Hills are combin'd against the Government, [and] are putting in new Cropps and bid us Defiance." Paul A. W. Wallace, Conrad Weiser, 1696-1760: Friend of Colonist and Mohawk , 294-97 (Philadelphia: University of Pennsylvania Press), 1945.